The Weimar Republic, that forward-looking liberal outgrowth of the collapsed German Empire, was not a peace-loving entity. Well before the rise of Adolf Hitler, the republic planted the seeds of military revival. The Versailles Treaty and its addenda destroyed German naval power — with serious help from the Germans themselves. On 21 November 1918, as part of the Armistice provisions, the bulk of the German High Seas Fleet sailed to Scapa Flow for internment. In May 1919, the Allies informed the German delegates at Versailles that all the ships at Scapa Flow would have to be turned over to the Allies, with most going to Britain. Rear Admiral Ludwig von Reuter reacted by ordering the fleet to scuttle itself, and on 17 June 1919 twelve battleships, five battle cruisers, eight light cruisers and fifty destroyers went to the bottom of the anchorage. The gesture did little for Germany: The angry Allies made the Germans hand over all their remaining modern warships, and billed them for the scuttled fleet. When the new Reichsmarine was founded on 31 March 1921, its leaders foresaw Germany going to war with an alliance of France and Poland. Britain and the United States, they believed, would stay neutral in such a conflict. British Prime Minister David Lloyd George’s behavior during the Russo-Polish War of 1921 seemed to confirm this belief, as Britain remained aloof while Poland was nearly overrun by the Red Army. Vice-Admiral Hans Zenker, the Reichsmarine’s commander from 1924 to 1928, prepared the navy’s building program around this assumption. Germany would have to interrupt maritime contact between France and Poland, prevent French landings on the German coast, and conduct long-range commerce warfare against French interests. The fleet the Nazis would eventually inherit was built to Zenker’s specifications. When the Reichstag believed Zenker had pressed too hard for new ships, he gave way to Erich Raeder, who took a much slower approach and would lead the navy into the Second World War. The Reichsmarine’s first ships were a passel of leftover veterans of the pre-dreadnought era: eight battleships and eight light cruisers, plus 12 destroyers and 12 torpedo boats. The navy was limited to 15,000 men, so even this small fleet could not all be operational and two of the battleships were disarmed and used as tenders while two others remained in reserve. The navy was allowed to replace its cruisers when they became 20 years old, and this exception applied to all of them by 1922. The Reichsmarine laid down the light cruiser Emden in late 1921 to a design very similar to the High Seas Fleet’s final class of cruisers. Only six of the allowed eight cruisers could be in service at any one time, so during the rest of the 1920s the navy laid down four more modern light cruisers as well. Runaway inflation and economic collapse delayed these for a couple of years. A final cruiser to make the full six, which became Nürnberg, was in turn delayed by the outbreak of the Great Depression and not laid down until 1934. Though this came after the republic’s fall, she was part of the Reichsmarine program rather than the Nazi one that followed. Germany was not a party to the Washington Naval Limitations Treaty of 1922; she had her own limitations imposed by the Treaty of Versailles. Warships could not exceed 10,000 tons and could not be armed with guns larger than 11-inch (280mm). This would, it was apparently supposed, yield only coast-defense ships similar to those operated by the Swedish navy. Zenker famously manipulated these limits to produce the armored cruiser Deutschland. She had thin protection but very long range, as befitted her role as a commerce raider. German propaganda claimed she could outrun what she could not outfight, and outfight what she could not outrun. Though not exactly true, it made a good tag line. During the 1920s, many navies looked at building what the naval journals of the time called a “Washington Treaty Cruiser Killer.” This was a ship of high speed and light armor, designed to destroy the “treaty cruisers” of the time. The Washington treaties limited heavy cruisers to 10,000 tons and an armament of 8-inch guns, but put no limit on their length. Thus most navies built very long ships of relatively high speed and thin armor. 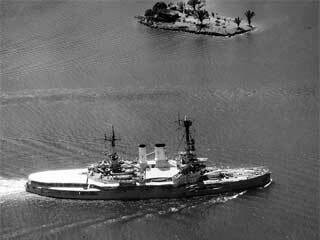 Battleships, meanwhile, were limited to 35,000 tons and 16-inch guns. Plus each signatory had an overall tonnage limit. Some thinkers pointed out that two 17,500-ton ships with large-caliber guns could be built on the allotted tonnage for one battleship. The Washington Naval Treaty set 17,500 tons as the minimum displacement for a ship carrying guns larger than 8 inches, acknowledging this possibility. Italy actually authorized a pair of such ships in 1928, but the Great Depression scuttled them. Zenker wanted a pair of them for the Germany navy as well. Germany had re-entered world diplomacy in 1925 with the Locarno Pact, and appeared well on her way to re-joining the family of nations. He seems to have thought an increase in the Versailles tonnage limit could be negotiated, as well as an increase in main gun caliber from 11 inches to the 12-inch size then being advocated by the British for all nations. Accordingly, he ordered a design prepared along those lines. His cruiser killer would have good range and a thin skin, and carry eight 12-inch guns in four double turrets. Secondary guns would be nine 5.9-inch guns in the same turrets then in production for K-type cruisers, and she’d have a bank of three torpedo tubes on either side. Her armor would be the same as Deutschland, then also in the design stage, but she would have considerably greater speed (34 knots against 28). Her range would be less than Deutschland, as she carried turbines like the last Imperial battlecruiser designs rather than diesels like Deutschland. This ship would have little chance in battle against a true battleship; her cruiser-scale armor would not stand up to heavy guns. But with a speed of 34 knots, hopefully she wouldn’t have to, and could run down and destroy enemy cruisers from well outside their gunnery range. International diplomacy did not in fact yield the agreements for which Zenker hoped; German diplomats don’t appear to have even asked for them. Of course, harsh reality should not intrude into a game based on war plans. 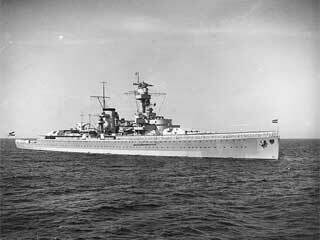 The Reichsmarine planned to use this ship, so we’ve made her available to gamers. Since Zenker wanted this ship for commerce raiding against the French, we’ve included two of them in U.S. Navy Plan Gold along with scenarios forcing the French to hunt them. Click here to order Plan Gold now!